Variations: Try using wholemeal self–raising flour for a nutty flavour and add grated rind of 1 lemon. Exercise can increase your basal metabolic rate (BMR) for approximately 24 hours after exercise is completed -- a real help in weight reduction. 1Place first 6 ingredients in saucepan (or in bowl in microwave oven) and heat until NUTTELEX is melted. 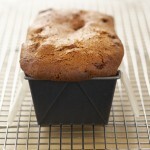 3Grease and line a 22cm x 14cm loaf tin and bake for 40–45 minutes at 160°C. The loaf is cooked when an inserted knife or skewer comes out clean.